Yoga classes and meditation rooms have become a common sight in tech offices. 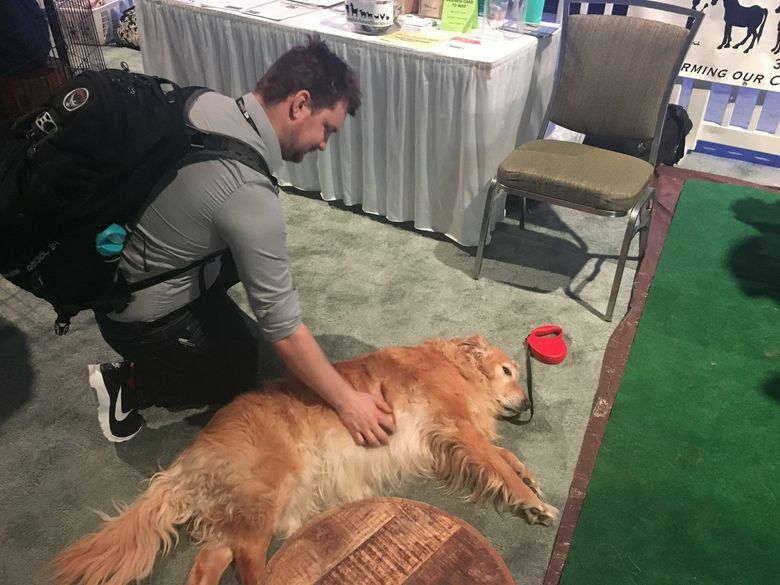 But Microsoft took relaxation a step further at its developers conference in downtown Seattle this week: It brought in farm animals. Amid the sea of developers at Microsoft Build at the Washington State Convention Center lay a small cordoned-off area filled with furry creatures. It’s a first for Microsoft and for the nonprofit that brought the animals, Bellingham-based Animals As Natural Therapy. The organization, which has a five-acre farm in Bellingham, usually works with at-risk youth and veterans. The 12-person staff also bring animals to off-site visits about five times a month, but that’s generally to nursing homes and memory care facilities — a bit different from tech conferences. Still, it was too good an opportunity to pass up, said Jessie Pemble, a manager at the nonprofit. People were streaming through the corner all day, she said Tuesday, many gasping in delight when they saw the animals. “Animals are really good at teaching us social and emotional skills,” Pemble said. The developers were already trained — everyone was respectful and careful with the animals, she said. For those far from home, Gabby the golden retriever was a favorite. “I’m missing my dog,” said Marcus Hellgren, who traveled from Sweden to attend Build, as he sat next to Gabby. Microsoft’s Krug also led stretches during the conference’s first-day keynote speeches, which stretched three hours and thirty-five minutes. She wanted everyone to stay relaxed, but the cuddle corner had another, unintended outcome. People were bonding as they pet the animals, and she noticed engineers and customers talking to each other as they might not have had a chance to otherwise.